With Mother’s Day just around the corner, we thought we’d share a few simple, healthy breakfasts that the little ones can prepare with an older sibling or responsible adult for Mum’s Mothers Day breakfast. These thick, rich, delicious yogurt pancakes are a breakfast winner both in taste and nutrition, made with wholemeal flour, Greek yogurt, and blueberries. Stir the dry ingredients into the wet mixture and stir until just combined (don’t over mix!). Heat a frypan over medium heat and melt the extra coconut oil. Once the frypan is hot and the coconut oil is melted, ladle the pancake batter onto the frypan. Let pancakes cook for 2-3 minutes until bubbles form. Flip and cook another 2 minutes until other side is lightly browned. Remove and set aside. Repeat with remaining batter. 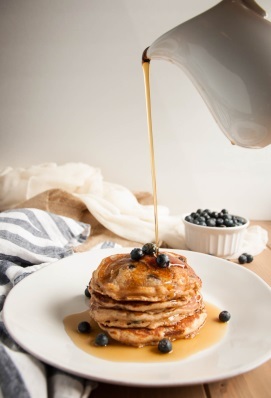 These pancakes are a much healthier option to the premixed variety; the wholemeal flour adds an extra layer of vitamins and fibre, whilst the Greek yogurt adds protein and filling staying power that most pancakes just don’t give you. Mix all ingredients in a medium sized bowl using a hand blender or stick blender until batter is a pour-able consistency. Cook all pancakes in a large pan for approximately 2-3 minutes per side until bubble form and both sides are golden brown. Place all ingredients in a small pan & gently bring to the boil. 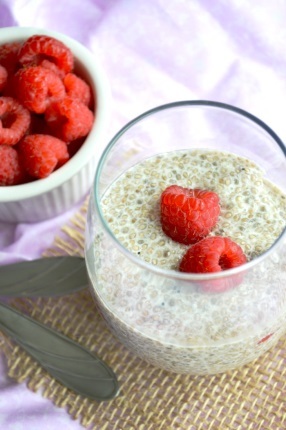 Chia pudding is a great healthy breakfast option that mum will enjoy and is easy-to-make. Packed with fibre, protein & omega 3, mum will love this yummy treat. ps. Make sure you prepare it on Saturday night so it has time to gel together in the fridge overnight. Place the chia seeds in a small bowl. Add the almond milk, honey and vanilla essence and stir to combine. Pour into individual jars, glasses or ramekins. Remove from the refrigerator, check that the chia seeds have gelled and add your topping. Little ones can gather and wash mum’s favourite fruits, and help decorate with strawberries, blueberries or grapes. Top off with some natural Greek yoghurt and a drizzle of honey.